The 'Gibson tucks' at the shoulder's edge are named after the familiar Gibson Girl made famous by the artist Charles Dana Gibson. 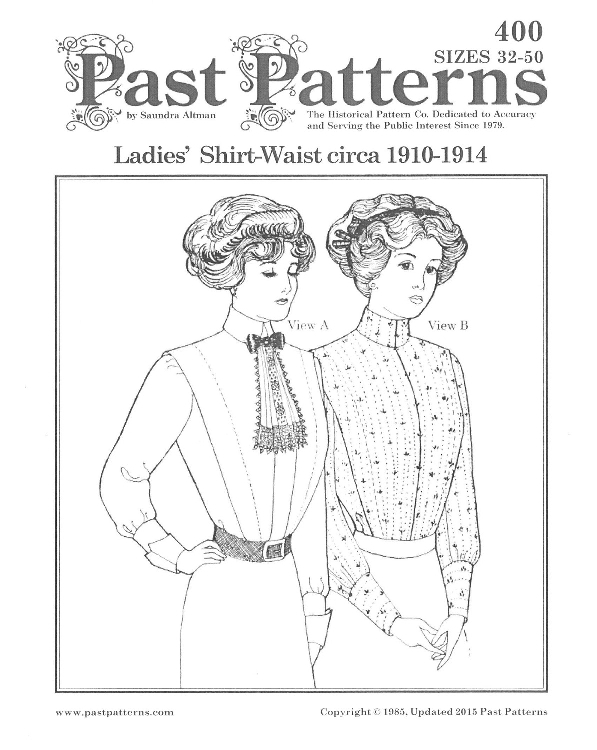 This ubiquitous shirt waist can be made with a standing collar or a shirt collar. The cuffs can be straight or turned back. The front closure can be made with a pleat at the front or a fly front. The shoulders are quite square. An inverted box pleat adds interest to the back view. Made in white cotton, stiffly starched, worn with a bow at the neck, a leather belt and dark skirt; this was the favorite uniform of the office or factory girl who wished to impress her employer with her efficiency. Looking for jackets to compliment your blouses? Look at #113 and #210.